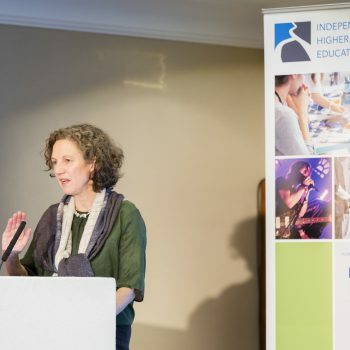 Ahead of the launch of the Office for Students, Independent Higher Education (IHE) has responded to the consultations on its regulatory framework, Degree Awarding Powers/University Title and registration fees. 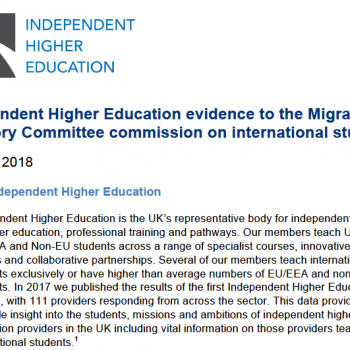 IHE has also responded to the consultations on the designated quality and data bodies for higher education in England under the new regulatory framework. We believe a single system of regulation for all higher education providers will bring consistency and clarity for students, providers and other stakeholders. The proposed risk-based approach of the Office for Students (OfS) to regulation should encourage proportionality and, if properly implemented, reduce the burden of regulation for most providers. The framework outlined in the consultation represents the building blocks of a level playing field for providers which encourages innovation and expands student choice. There is much still to be done, however, to enable the OfS to remove unnecessary barriers to entering the regulated higher education sector, and to ensure that institutional autonomy and innovative models of delivery can thrive in a single system still dominated, at least initially, by the traditional three-year undergraduate degree.